Algorithms), described in an IETF Internet-Draft, are not yet fully supported. page carefully before proceeding (note the -convert flag in particular). not provide such support for them. dacstoken, although some vendors produce tokens that can support multiple accounts. has a demonstration mode to simplify testing and evaluation. must either be deleted or a new one must be set. (unless an additional authentication factor is applied in some other way). password to fall within some number of time-step windows for these devices. of each mapping from serial number to secret key should be kept in a secure location. % dacsexpr -e "random(string, 20)"
One-time password devices and applications have the following operational parameters. references and manufacturers' documentation for details. The radix in which passwords are displayed. For HOTP mode only, the current counter value. The number of digits in each one-time password. The secret key (OTP seed). A unique identifier or name for the device. period of each TOTP password. synchronize the account with the device. 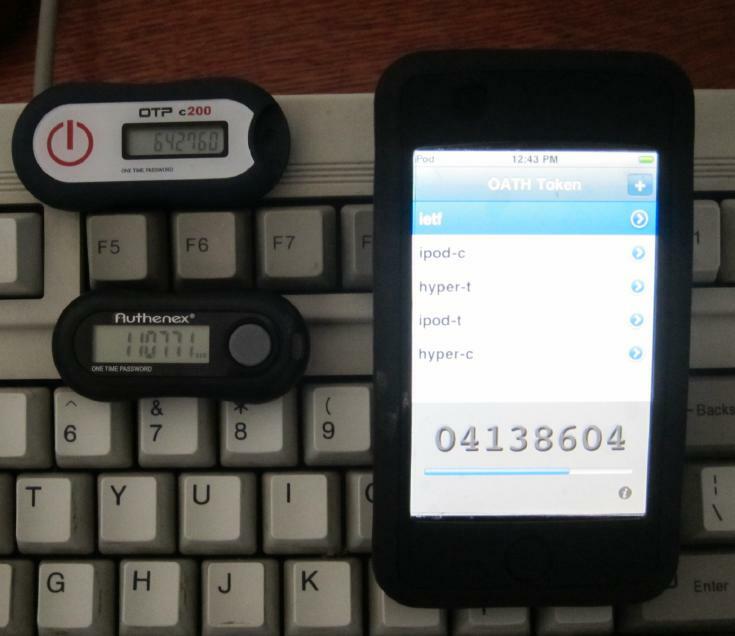 The name of the DACS account bound to the device. tamper-resistance, durability, key secrecy, clock accuracy, etc. of a hardware token). with impaired vision may have difficulty reading the display. local_passwd_authenticate or any other DACS authentication module. access is limited to the administrator and local_token_authenticate. need to beware of the case of two different Auggies, each using a different device type. users must know which type of device they are using (perhaps by afixing a label to it). Refer to important details regarding DACS identities. The -vfs is used to configure or reconfigure the auth_token item type. encryption keys are lost, the secret keys are practically unrecoverable. should be destroyed. If a token is lost, the corresponding account should be disabled. HOTP and TOTP on the iPod Touch, iPhone, and iPad. these products are officially supported by DACS. ·   Hardware tokens can be purchased directly from the vendors. responsibility of the token vendor. account information is written in a simple, application-specific (almost) XML format. blank lines are ignored, as are single line XML comments. Additionally, lines having a "#"
understood by a future version of dacstoken, or a conversion utility may be written. The standard format is likely to be considerably more complex than the DACS format. meaningless with the selected operation are ignored, although they still imply a mode. (e.g., when creating an account), an initial counter value of zero is used. Load an older format (prior to release 1.4.25) token account file from filename ("-"
implied. If no -enable flag is provided when creating an account, -disable is implied. have a PIN (or the existing PIN will not be changed). parameters are taken from the account. modified. This is mainly intended for debugging purposes. Load account and token information from filename; if filename is "-", stdin is read. will replace an existing account with imported data. the time and date of the account's last modification. be created and the old account to still exist. retained unless overridden on the command line. before it terminates; the user must contact an administrator for assistance. -totp-timestep, -digits, and -totp-base options are effective during this operation. Perform some self-tests, then exit. A non-zero exit status means an error occurred. together with the password for the current time are printed. accounts may have been modified. 10 (the default), 16, or 32.
however, so beware of the security implications. user to authenticate. It is not an error to enable an already enabled account. Use keyval as the secret key, expressed as a hex digit string. "-", the key is read from stdin. Prompt for the secret key, expressed as a hex digit string. The input is not echoed. flag is required when creating a new account. Use pinval as the secret PIN for the account. semantics) to describe the requirements for a PIN. Read the secret PIN from filename. If filename is "-", the PIN is read from stdin. Prompt for the secret PIN. The input is not echoed. The serial number, str, is a (purportedly) unique identifier assigned to the token. string not already assigned to a device. "-sw" to the vendor's serial number for the device. nwindows weakens the system by extending the lifetime of a one-time password. insensitively) SHA1 (the default), SHA256, or SHA512. secs weakens the system by extending the lifetime of a one-time password. specify the storage method for the accounts being acted upon. a programmable device, select a suitable random key and program it into the device. so), and configure the software. using the token to confirm correct operation. bobo.key. New accounts are disabled by default; use -enable to create an enabled account. The -list flag is redundant because it is the default operation. The -mode, -counter, etc. modifiers have no effect when listing. The exit status will be non-zero if this user does not have an account. or can be displayed by the token. more appropriate for a hardware token. The program will prompt for the new PIN. The program exits 0, or 1 if an error occurred. HOTP should probably be called COTP, but HOTP came before TOTP. WOTP? Listings may only be sorted by username. 1305) or equivalent be used on any host that runs DACS commands or web services. are all subject to change. TOTP password matching windows are symmetrical. Mutual authentication using tokens should be implemented. generously providing samples of their products and technical support.